Asics’s marketing pitch: Optimal support and comfort for runners of all levels. Upper: Engineered mesh, synthetic overlays. Midsole: Combination of Flytefoam and Flytefoam Propel foam, front and rear Gel units. 10 mm heel to toe drop. Widths available: D - regular (reviewed), 2E - Wide. The new last gives the Cumulus 20 much-needed toebox room, and the Flytefoam midsole makes the ride firmer. Our verdict: it's a decent daily trainer but yet to be the Cumulus everyone wants. Along with a few other shoes, we’re currently in the process of reviewing the Reebok Floatride Run Ultraknit. The new Floatride foam is lightweight, cushioned, and has a lively feel to it. And how we wish the Asics Cumulus and the Nimbus used something similar instead of Flytefoam. To be clear, using Flytefoam has its advantages. 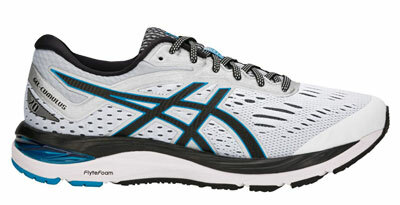 Asics’s new foam reduces weight and increases durability, both of which happen to be important performance parameters. And given the firm nature of the Flytefoam midsole, it is a good fit for models like the GT-2000 and the Roadhawk. But the use of Flytefoam in Asics’s cushioned trainer line-up is debatable. Both the Nimbus and the Cumulus are supposed to deliver a soft, cushioned ride. And they have – but that was all in the distant past. The last Cumulus version was a mediocre example both from a ride and fit point of view. The toe-box was shallow, the upper felt flimsy, and the ride experience wasn’t much to write home about. The Cumulus 20 gets a dual-layered Flytefoam midsole over the Cumulus 19’s EVA foam stack. The upper is built over a brand new last which creates a roomier toe-box and forefoot. With added overlays and a new mesh, the upper ends up feeling more structured than the 19. By any yardstick, the V20 is a noticeable improvement over last year. That being said, it’s easy to improve something which was mediocre to begin with. So it’s worth asking: Is the Flytefoam-infused Cumulus 20 the shoe it needs to be? In our opinion, the answer is no. 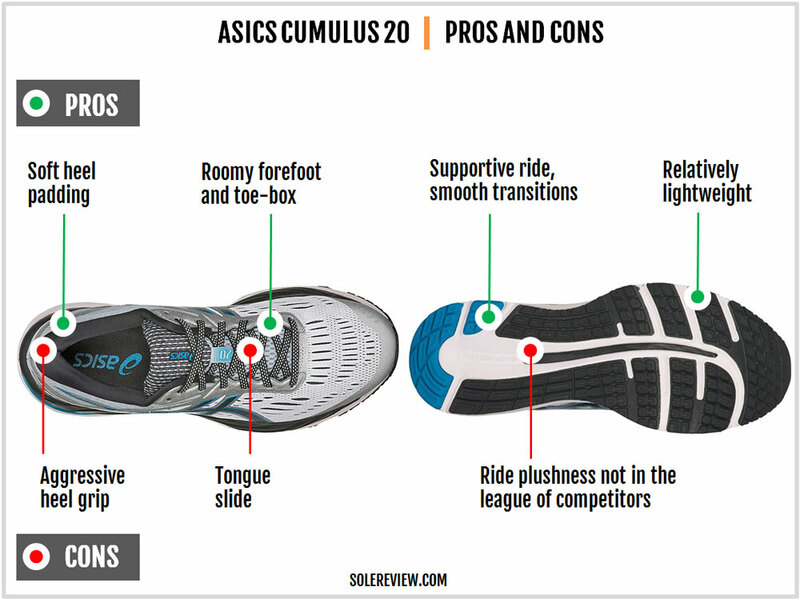 Agreed, the Cumulus 20 has a smoother ride than the 19. Yes, the shoe is much lighter and the upper fit has improved. While many will appreciate the roomier Cumulus, its firmer ride feels out of character for a product which is supposed to have a plush ride. A firm and supportive ride is not a bad thing in running shoe, but then, there’s a time and place for everything. As far as updates go, the Cumulus 20 is a major one. The sole composite is brand new from the ground up; two layers of Flytefoam replace the EVA-foam midsole of the V-19. The front and rear stack of 13 mm and 23 mm helps the midsole maintain its 10 mm heel-to-toe gradient. Technically speaking, it’s just a single layer of Flytefoam. The upper layer is Flytefoam Propel, a material which has a similar sounding name but lacks the fibrous texture of the original Flytefoam compound. Also gone are the visible forefoot Gel windows. No harm done though, as the visible Gel pad was never more than a visual prop. 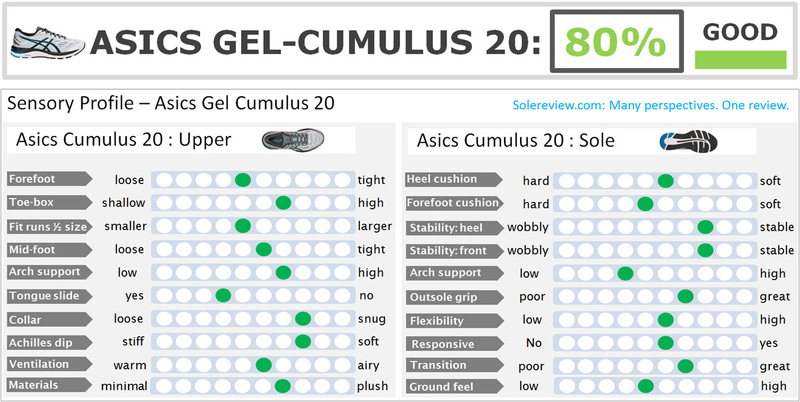 Like the Cumulus 19, the 20 also has a dime-sized and equally ineffective Gel pad under the forefoot. The new outsole uses a lot more rubber than the 19 and the plastic ‘Trusstic’ shank under the midfoot has been retired. Replacing the plastic shank are large rubber slabs which connect the front outsole with the rear. As a result, the Cumulus 20 no longer has the awkward gap under the midfoot. The outsole has a larger contact surface which is only split by the ‘guidance line’ which extends from the rear to the forefoot. The outsole has plenty of flex grooves. The forefoot is generously articulated and the heel crash pad is divided into multiple areas. However, the Cumulus isn’t overly flexible. The Flytefoam midsole adds structural stiffness – more so than the non-Flytefoam version. Like the Cumulus 19, there’s a single rubber lug mounted over the midsole on the inner side. While this is a part of the crash pad, the lug will take the brunt of most rearfoot landings. Since it’s independent of the rest of the outsole, there’s a piston-like effect happening during heel-strike. In some ways, the new outsole looks vaguely Nike inspired. The soft blown rubber part under the front and midfoot have rectangular lugs which resemble the popular waffle pattern. On a positive note, the traction over road and treadmill has improved since the previous edition. Also, the blown rubber outsole adds some softness and prevents (otherwise) jarring forefoot landings. All these updates help the 20 shed a full ounce over the 19. At just over 10 ounces, the 20 is fairly lightweight for its category. Take the Cumulus 20 out for a quick 10k run, and the changes in the ride behavior become apparent. To begin with, the ride is firmer and smoother than the 19. As a midsole material, Flytefoam is firmer than standard EVA so that leads to a corresponding change in the ride quality. We’re not sure what exactly the Flytefoam Propel is made of. What’s more, it also exists on the Kayano 25, albeit in a firmer avatar. With the original Flytefoam recipe forming the dominant part of the midsole, it makes the Cumulus 20’s cushioning firmer than the 19. It won’t be a stretch to say that the V20 is Asics’s firmest Cumulus yet. The midsole softness is concentrated near the top. 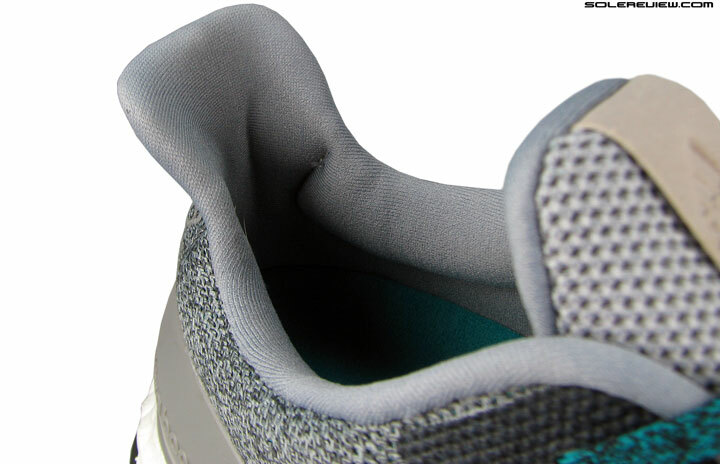 The removal Ortholite insole and the foam lasting make the upper midsole soft under the foot. The Propel foam is slightly softer than the Flytefoam layer underneath it. The visible heel Gel window creates a bit of outer cushioning bias as the lateral side is softer than the inner sidewall. 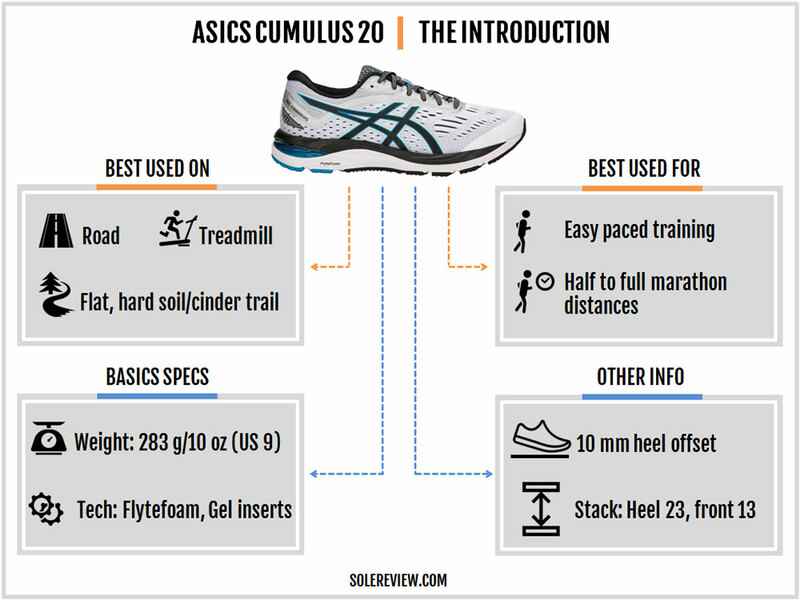 So the Cumulus 20 is a neutral shoe in the traditional way – decently supportive with a bit of a lateral midsole bias. The Cumulus 20’s ride acquires a smoother tone, thanks to the Trusstic-less midsole. The filled up midfoot section allows the weight to progress seamlessly. The firmer ride also helps with quicker transitions and accentuates the supportive aspect as well. If a faster Cumulus is what you were after, then you have it. The 20 has greater efficiency when it comes to transitions and is much lighter than the 19. The Flytefoam is also more responsive than the legacy EVA-based foam. 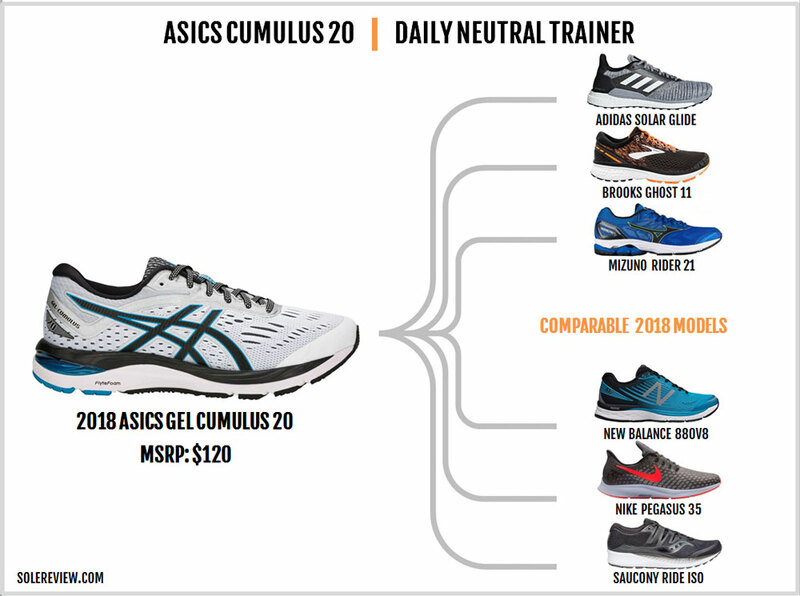 Regardless of the changed ride character, the 20 is a competent neutral training shoe with increased versatility over the 19. It works for relaxed paces (10 min/mile or 6 min/km or slower) as it does for slightly higher paces (7 min/mile or under 5 min/km). Also, there’s ample padding of a medium-soft kind for racking up longer daily miles. The reduction in weight makes the new Cumulus less of a chore to run in than the 19. But is this the Cumulus everyone needs? The Cumulus has historically been a toned-down version of the Nimbus, a shoe which is supposedly Asics’ plushest ride. Not so long ago, the Cumulus 17 came with a softly cushioned midsole. The Nimbus and the Cumulus are named after clouds and originally alluded to the supposedly cloud-like and pillowy soft ride. But both these models are increasing turning firmer with each year, and there’s less of a connection with their names. The Cumulus isn’t supposed to be anything other than a cushy shoe, and plugging Flytefoam into every product is certainly isn’t the answer. We’re not sure what Asics has cooking in their labs, but if there’s a Boost/Floatride/React equivalent, let’s see it in the Nimbus and the Cumulus first. Finally. The Cumulus gets a deeper and roomier toe-box. We thought that day would never come. But what do you know – it has. 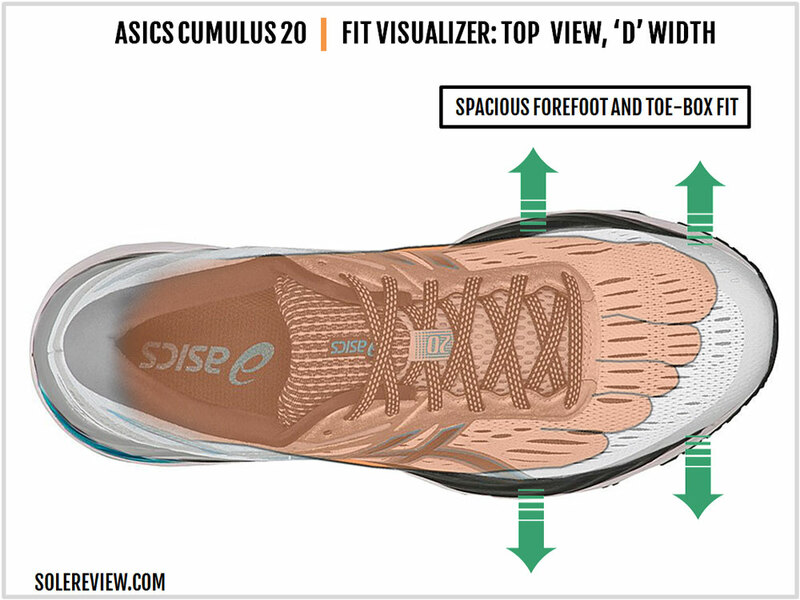 The 20 gets a modified last which creates increased splay room for the toes, along with a comfortable forefoot fit. It also helps that the materials and the construction get a makeover. Instead of the synthetic band which squashed the toe-box of the Cumulus 19, the 20 uses a filmic toe-bumper. It’s not even a thick synthetic, but more like a thin layer heat-melted over the mesh. Asics uses a slightly spongy engineered mesh which is a good match for the updated last. This gives the interiors a softer feel than the outgoing Cumulus. On the flip side, the insides feel a bit warmer because of the densely knitted structure of the new mesh. A 2E width is also available in case one needs additional forefoot room. The midfoot fit is more supportive due to the updated design. 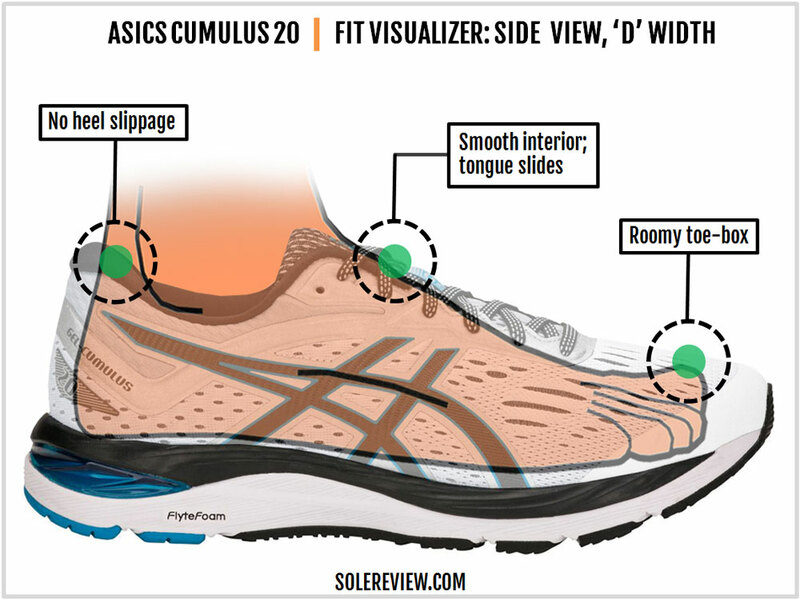 The Cumulus 19 did not even have the Asics logo on the inner side, just a narrow synthetic overlay. When compared to the 20, the 19 looked downright flimsy. The V20 makes amends with respect to the upper construction. An Asics logo made of fused synthetic hugs the arch and helps increase structural strength. The logo forms the molded lacing eyestay and extends around the heel as well. There’s very little reflectivity on the Cumulus 20. Only the small heel piece with the numeric ’20’ call-out is all that you get for low-light running. There’s no change in the way the tongue is attached to the upper. The padded tongue sits comfortably over the foot and offers adequate insulation from the top-down lacing pressure. While the lining fabric is new, the tongue is still devoid of a sleeve and will slide sideways. Though the (previously) round laces are swapped with flat ones, it doesn’t make a lot of difference from a functional standpoint. The Cumulus 19 had three metallic eyelets near the tongue flap. So the round laces passed through them smoothly without adding friction to the lacing experience. The synthetic lacing panel extends right up to the last (heel lock) eyelet. This change makes the last two lacing rows a bit stiff, thus requiring some break in time. The heel is deeper, more padded, and fits snugger than the 19. Along with the external changes – such as the synthetic overlay wrapping around the heel – the internal counter appears to have a tighter molding. The rigid heel might not be liked by everyone. It is not because Asics has changed; rather, the rest of the market has moved towards a different direction. 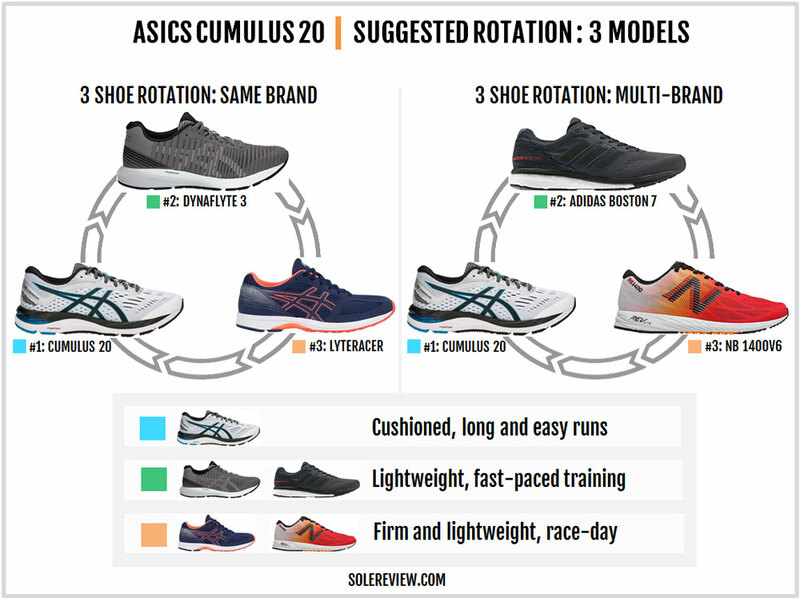 While brands like adidas and Nike have adopted a ‘slope-out’ heel style, even Saucony and New Balance are using less aggressive heel counters. 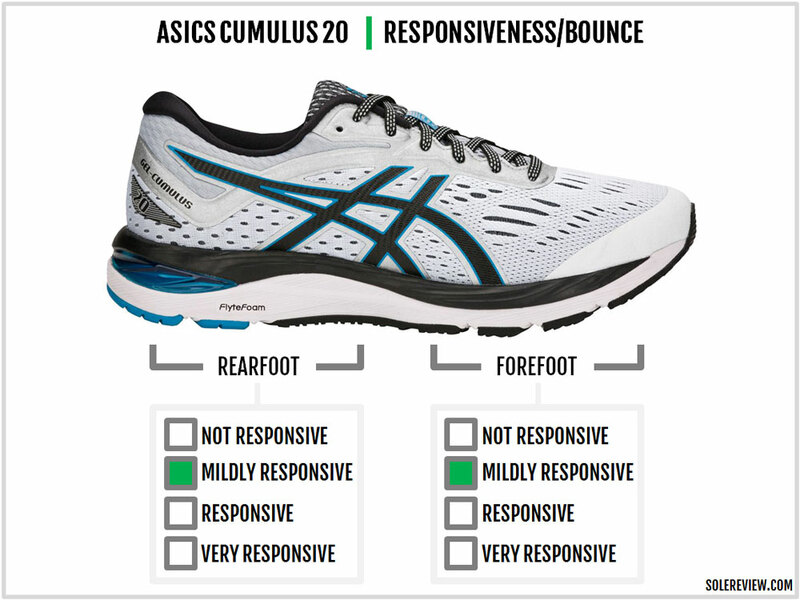 In that context, Asics’s traditional heel molding feels overly structured. Though the Cumulus 20 fits true to size, we felt that the upper was slightly shorter (say, around +1/3rd) in sizing than the 19 due to the redesigned heel. 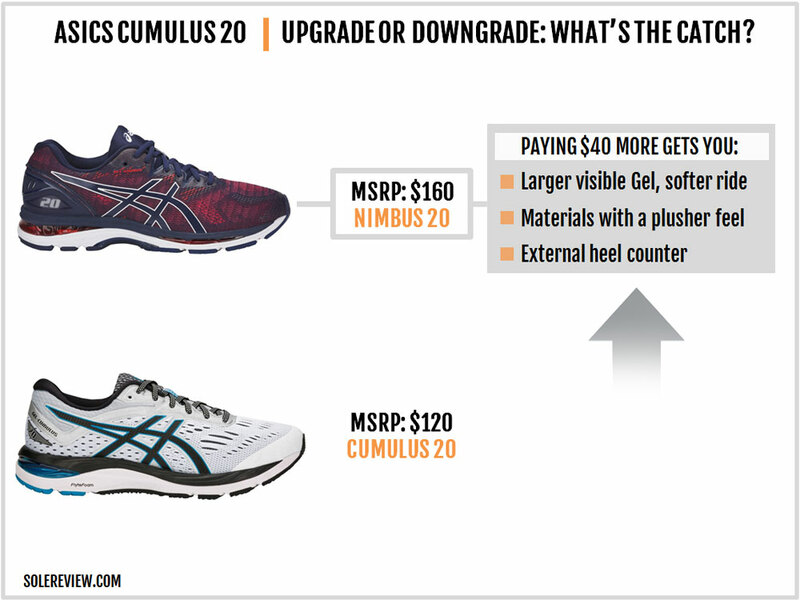 The Cumulus 20 is more durable than the 19. The upper has better structural integrity due to the overlays and the thicker mesh. 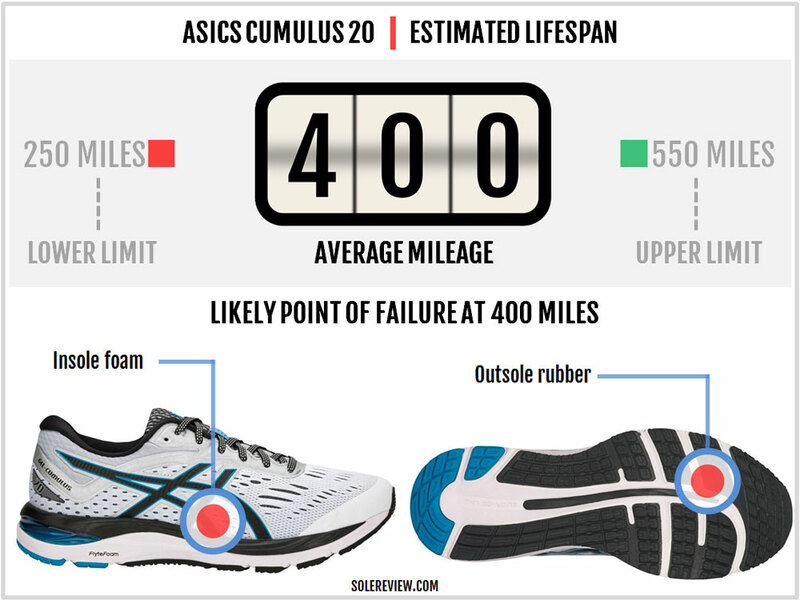 The Flytefoam midsole has a longer life expectancy than standard EVA. Around 400 miles is a reasonable ask, and most runners will get it from the Cumulus – if not more. Components like the insole foam and the blown outsole rubber will go through the wear and tear process sooner than the rest. The Cumulus’s reconfigured upper fit comes as a much-needed respite from the previously cramped interiors. The toe-box and the forefoot have plenty of room, and the near-seamless upper produces a smooth and comfortable environment. The heel grips securely with plenty of plush padding. Ditching the plastic shank and introducing Flytefoam makes the ride quality smoother and decreases the weight. The updated outsole design grips better than the last version. That said, the somewhat firm ride is at odds with the Cumulus’s positioning. The latter is supposed to a softly cushioned daily neutral trainer, but the real-world ride experience suggests otherwise. By using Flytefoam, the soft cushioning experience remains elusive, and that’s not exactly a good thing for a shoe such as the Cumulus. There are a couple of minor flaws, such as the tongue slide and the low levels of reflectivity. Some runners will find the heel hold overbearing, but in our opinion, that’s a subjective thing rather than a universal flaw. If the Cumulus doesn’t have the cushioning softness you want, the Nimbus 20 is the higher priced alternative. Admittedly, the Nimbus isn’t as soft as it used to be. However, most things being relative, the Nimbus does offer significant plushness over the Cumulus. The upper is softer and so is the ride. Additional embellishments like a visible forefoot Gel along with an external heel clip are offered on the Nimbus. The midsole relies on the legacy construction, and this means there’s a plastic Trusstic shank hugging the underside. The Dynaflyte 3 is a firmer and lighter training shoe which works better for faster days than the Cumulus. 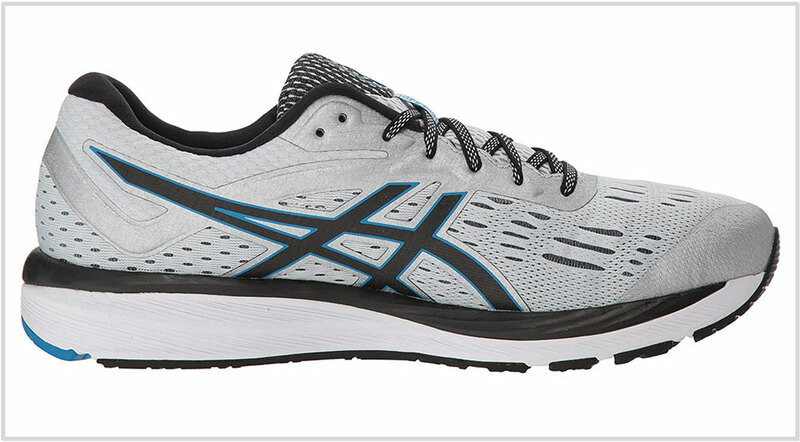 If a race-day shoe is what you’re after, the Asics Lyteracer TS 7 with its classic racer silhouette is a good buy. Also feel free to rotate the Cumulus 20 with adizero Boston 7, a lightweight and cushioned trainer for speedier miles. And just in case the Lyteracer doesn’t feel like your perfect road racer, try the excellent New Balance 1400V6. Both the road racers also happen to be excellent treadmill running shoes. The $120-140 neutral cushioning segment has many shoes to offer. If you’re shopping for a firm neutral trainer, look no further than the Mizuno Wave Rider 21. The Wave plate system gives the midsole a ride signature unlike any other. There’s plenty of interior room too. The Saucony Ride ISO has a bit of Cumulus 20 in it – the midsole isn’t overly soft and delivers an efficient ride. While its upper isn’t perfect, you’ll get a sleeved interior which is lacking on the Asics. The Brooks Ghost 11 and the New Balance 880V8 are medium soft and supportive neutral trainers. The recently updated Nike Pegasus 35 has a full-length Zoom Air equipped midsole under a spacious and smooth-fitting upper. If you’re searching for a daily training shoe with a soft ride and a longer life, the adidas Solar Glide gives you that. The full-length Boost midsole has lots of deep cushioning, and the Continental rubber outsole has been tried and tested for hundreds of miles.